22 May 2017 time 22:31 . 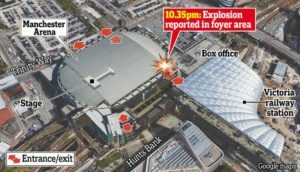 A suicide bomber (Salman Ramadan Abedi) detonated an improvised explosive device, in the foyer area of the Manchester Arena. The attack took place during the egress of the Ariana Grande concert. 14,200 people were attending the concert. Many exiting concert-goers and waiting parents were in the foyer at the time of the explosion. According to evidence presented at the coroner’s inquest, the detonation of the bomb killed people who were up to 20 metres away. The attack was in the foyer area, external of the arena; linking the arena to the near by train station, car parks and public walking routes. It should be noted that the foyer area does not fall under the control of the arenas security provider. At least 22 people, including children, have died after an explosion hit Manchester Arena at the end of a pop concert by US singer Ariana Grande. A further 59 people were injured in the explosion which Greater Manchester Police believe was carried out by a single male attacker. Witnesses have described the chaos and horror after a fatal explosion at the concert by US pop star Ariana Grande at Manchester Arena. Twenty-two people were killed in the explosion, including an eight-year-old girl. A further 59 people, including 12 under the age of 16, were injured and taken to hospital. Twenty-two people have been killed and more than 50 injured in an explosion at an Ariana Grande concert at Manchester Arena. 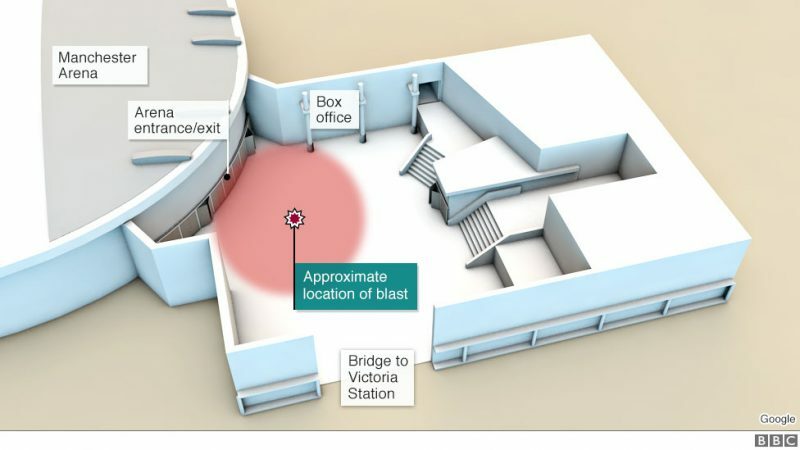 The blast tore through the venue as the concert – attended by 21,000 people – finished shortly after 10.30pm on Monday night. Police said the attack was carried out by one man, who died in the explosion. Event organisers have described the type of attack that killed at least 22 people and injured 59 outside a concert arena in Manchester as the “greatest challenge” to security operations, exposing a weak spot just beyond their checks and patrols. A terrorist attack hit a concert in Manchester on Monday evening. Here is what we know so far: What has happened? Police have confirmed that at least 22 people were killed in the explosion at an Ariana Grande concert at the Manchester Arena. Some of them were children. How to talk to your children about the Manchester Arena attack.